Natascha Beinker serves as Deputy Head of the Division "Cooperation with the private sector/ sustainable economic policy" at the German Federal Ministry for Economic Cooperation and Development (BMZ). During the German G20 Presidency, she is chairing the G20 Global Partnership for Financial Inclusion (GPFI). 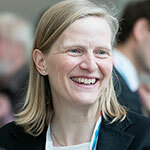 Further she is German Co-Chair of the GPFI Subgroup on SME Finance. Natascha joined BMZ in 2002 and has since then held several responsibilities, including serving as the Head of Development Cooperation at the German embassy in Kenya. Before joining the ministry, she worked for Deutsche Post/ DHL and as business journalist. Natascha studied Economics and Political Science in Germany and Canada.